Every organization strives for a workforce that is engaged, inspired, and motivated to perform at its best day in and day out. But what is the reality? According to Gallup, only 13 percent of all employees worldwide today are engaged in their jobs — an alarming statistic given the importance of the workforce in fueling growth and meeting other key enterprise goals. Employees are typically an organization’s most vital (and expensive) asset, and when they are disengaged and/or disenfranchised, the ripple effects across the business can impact your profitability and branding. In fact, each employee generation — and each individual — has unique needs and expectations regarding work. So how do you engage and inspire them? It requires a creative and differentiated approach that accounts for the unique characteristics and requirements of each generation. 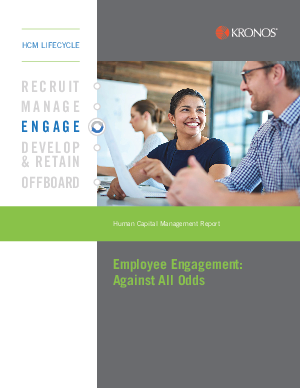 Fortunately, new human capital management (HCM) technologies are available today that can help you optimize employee engagement across all generations! Let’s learn more…download this free paper today!